The boys’ cross country team will return many of its key runners next season. If this season was any indication, the Whitman- Hanson Regional High boys’ cross country is heading in the right direction. For the Panthers, despite their 3-5 record, nearly all of their production came from runners who will be back in the fold next fall. The team’s top seven was made up of three juniors, three sophomores and a freshman, with other underclassmen seconds behind. Sophomore Theo Kamperides was W-H’s top finisher in every race en route to league all-star status. Kamperides, who owned one first-place finish, three second-place finishes and four third-place finishes, posted a personal-best average time of 17:29. Kamperides’ first-place finish at 17:44 sparked the Panthers past Scituate, 21-40, Oct. 16. Junior Brandon Hager (17:48) was right behind Kamperides in that race, like he was all season. Hager was W-H’s No. 2 runner with a career-best average time of 17:48. W-H’s other two wins came over Pembroke, 24-36, in its season opener and against Silver Lake, 24-37, Oct. 11. “If one were to look at our race results [they’d] undoubtedly notice that with each successive week nearly all of our runners improved from his previous race,” George said. While no runners caught George by surprise statistically, he said he’s always surprised when people he hopes will be good leaders become just that. Schraut will be the Panthers’ only loss from inside their top 10 runners. Head coach Steve Goerge is expecting the boys’ team to be competitive while he doesn’t know what to expect from the girls’ team just yet. Personal bests are always key in the sport of cross country. Without shooting for them, you’re doing your team a disservice. 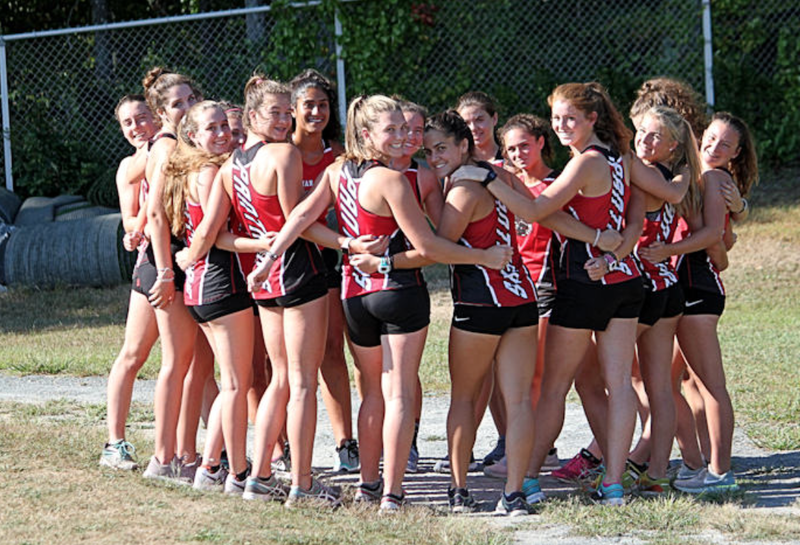 Cross country is also one of the rare sports that celebrates the lowest score, not the highest with a first-place finish yielding one point, a secondplace yielding two and so on. At Whitman-Hanson Regional High, fifth-year head coach of the boys’ and girls’ teams Steve George is hoping to see his runners flourish thus producing some positive results. On the girls’ side, senior captain Maeve McDonough will lead the way. Runners two through four will be juniors Niki Kamperides, Tori Boss, Tori Carleton and at No. 5 will be senior captain Maeve Rooney. George said freshmen Anna Flynn and Sarah Boulger have impressed him early on while seniors Dorothy DiMascio-Donohue and Gabbie Trongone figure to factor into some meets. “I think everyone has a lot of potential and they don’t realize it until they actually start getting serious about it,” McDonough said. The girls return to the course Wednesday, Sept. 12 at 4 p.m. on the road against league opponent Hanover. The boys’ team has “the makings of a very good team”, according to George. Sophomore Theo Kamperides is the Panthers’ top returning runner and junior Brandon Hager is their second best. Adam Solari, W-H’s third best returning runner, will captain boys alongside senior Shane Schraut. “Adam comes from hockey and he’s a tremendous hockey player, strong hockey player,” George said. “He’s well-liked by his teammates. I think the fact that he’s well-liked is going to help him with leadership. Schraut said the Panthers like to encourage each other regardless of where they stand on the totem pole, which will work to their advantage this season. “Say one guy is straggling, one guy from behind will tell him to keep going and just keep pushing him to do harder and better,” Schraut said. “I think if we push each other, we’ll be a really good team,” Solari said. Juniors Matt Avery, Dylan Burns and Nick Hanley along with , sophomores Matt Butler, Liam Cafferty and Chris MacDonald and freshman Evan Jewett will also make impact for the Panthers, who return to action at Hanover on Wednesday, Sept. 12 at 4 p.m. 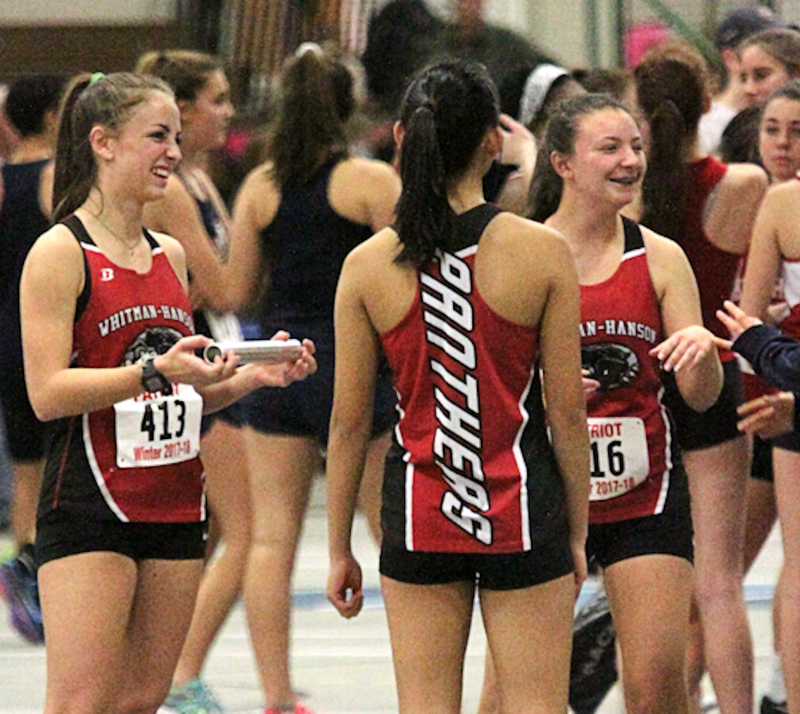 Both Whitman-Hanson Regional High track teams will rely on their legs this spring. There is no secret as to what will power the Whitman-Hanson Regional High boys’ and girls’ outdoor track teams this season. It’s their running. 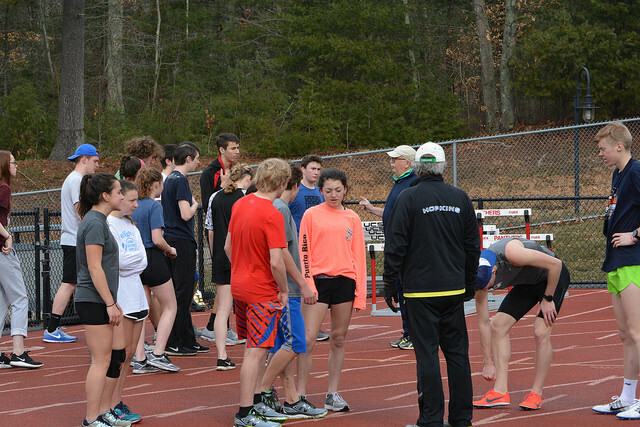 As Stephen Schilicting enters his first season at the helm of the boys’ outdoor track team, he’s excited by what he’s seen. Newman and Ryan, who are both seniors, are about as good as it gets. Newman has taken his game to a whole new level this season, racing to first-place finishes in his first five meets during the fall in cross country while garnering Patriot League All-Star recognition. He was also a league all-star in the winter as well. 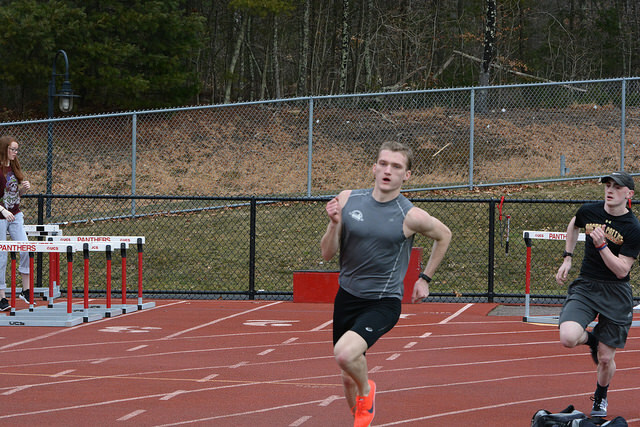 As a junior, Ryan was a three-season Patriot League All-Star in cross country, indoor track and winter track. Ryan captains the team alongside classmate Alex Uva and junior Billy Martell. Martell is going to play a key role in what Schilicting coined the strength of the team – distance running. Schilicting has some pretty good hurdlers as well, led by a pair of juniors. The Panthers, who opened the season with a 125-10 victory over North Quincy yesterday, will be back in action Tuesday, April 10 at 3:35 p.m. on the road against Hingham. As for the girls’ outdoor track team, its seen a participation increase as well – up from 34 athletes last season to 42 this spring. Fifteen freshmen and 15 sophomores will account for roughly 70 percent of its roster. Freshman Gabrielle Coste is one of those newcomers. “She has high jumped 5 feet as a middle school student so I’m looking forward to seeing what she can do at this level,” George, whose team finished 2-4 last season, said. While Coste may headline the first-year participants, senior captains Nicole Norve and Lilly Perkins lead the returnees. Norve, an Adams State University commit, has been a league all-star three times in cross country, twice in indoor track and once for outdoor track. Perkins will anchor the 400-meter dash and long jump – two events she excels in. “They’re multi-sport captains and they’ve had some experience at it and performed well in the past as captains and they continue to do that, despite the fact that they have less than 60 days of school left,” George said. Juniors Ally Bartlett and Dorothy DiMascio-Donohue, sophomores Anika Floeck and Samantha Perkins, and freshman Isabelle Amado will also give the Panthers a boost this season. The Panthers, who opened the season yesterday with a 76-58 loss to North Quincy, will be back in action Tuesday, April 10 at 3:45 p.m. on the road against Hingham. Seniors Andrew Newman and Nicole Norve were standouts this cross country season at Whitman-Hanson Regional High. Another cross country season has crossed the finish line at Whitman-Hanson Regional High. Andrew Newman led the way for the boys’ team, which wound up with a 4-3 record. The senior was unbeatable in his first five meets, as he raced to first-place finishes in every single one. He also set four personal records throughout the fall. Steve George, who serves as the head coach for both the boys’ and girls’ cross country teams, said Newman is self-motivated, extremely hard working and just loves to run. Not only did Newman have a season to remember, many of his teammates did as well. Fellow senior captain Jack Ryan finished the fall boasting seven top-five finishes and sophomore Adam Solari improved on his numbers significantly from a year ago, as did classmate Brandon Hager. Freshman newcomers Liam Cafferty, Theo Kamperides, Chris MacDonald and Aiden O’Brien were all welcome sights as well. Cafferty and Kamperdies ended the season as two of the Panthers’ top-five runners. George said his club’s biggest strength over the past few months was the leadership it received from its captains Alex Uva and Ryan. The girls’ team, which finished at 3-4, was in a lot of close meets, as three of its losses came by 15 or fewer points. One runner who stood out from the rest was Nicole Norve. The senior captain hustled to a first-place finish in the Panthers’ first five races. 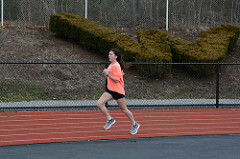 Her second-place outings came against Plymouth North on Oct. 17 when she crossed the finish line one second out of the top spot, and on Oct. 24 against Plymouth South when she lost to eventual league MVP Jillian Callaghan by 17 ticks. George said Norve is as fierce as a competitor as there gets. But it takes more than one runner to be competitive, and W-H had no problem with that. Seniors Julia Cosgrave and Camryn Boyce were about were steady presences all season. Coming into the season, one of George’s goals was to have his runners achieve their own milestones, and that came to fruition. Sixteen of the 20 girls established personal records with two of the remaining four out much of the season with injury. As the Panthers look toward next autumn – when this wave of juniors will be looked upon to carry the load – there is a lot to be excited about.